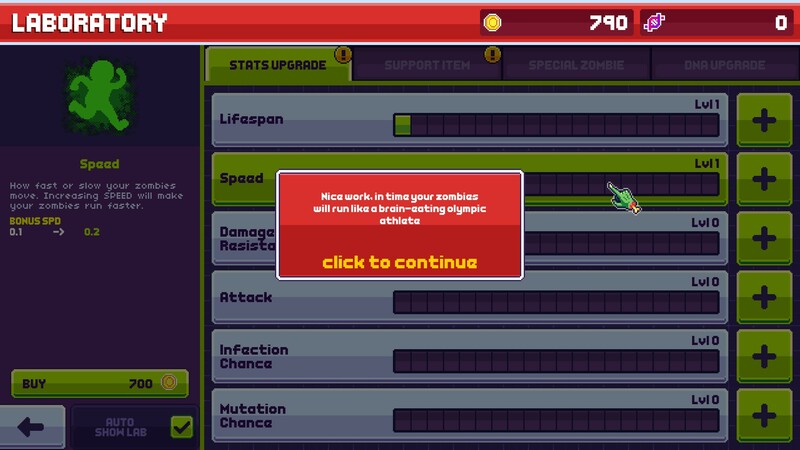 It’s been a long while since I played the original Infectonator game on Newgrounds. It started out as a Flash game, but when I moved onto Steam I feared the series was left in the past. 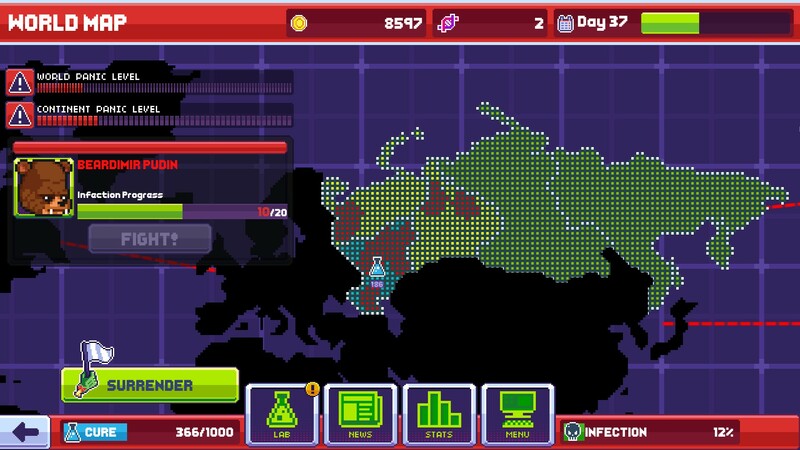 Little did I know Infectonator made the jump to Steam, and now we flash forward a bit to today’s preview of Infectonator 3: Apocalypse. The premise of the game is pretty basic. 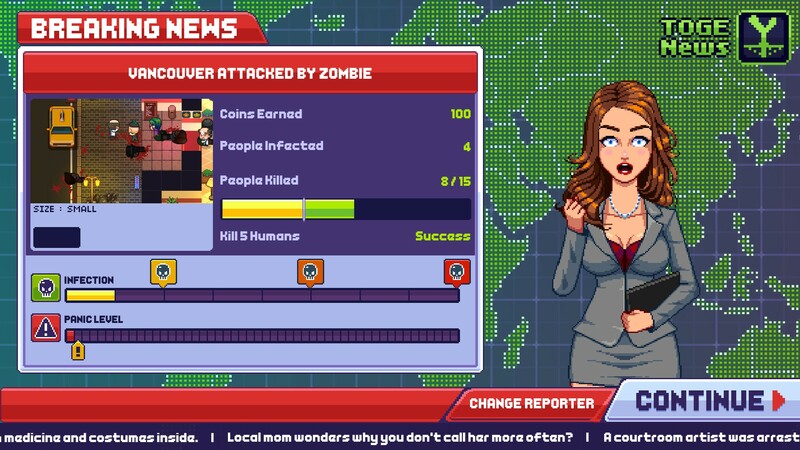 You’re an evil sort and want to take over the world using your zombie hordes. But zombies don’t make themselves, so it’s up to you to brew an army of hideous corpse soldiers. During levels, you’re represented by a skeletal hand, and you start each stage by clicking on a wandering human. Doing so infects them, transforming them and adjacent victims into zombies. Then they do what zombies do best, running after humans and chomping on their brains. The catch is that your zombies won’t stay fresh forever, and after a few seconds will fall down dead. To compensate, you can use various items to aid you, such as grenades, land mines and infectious goo. There’s a lot you can use, but you have to unlock it first, and then buy it. But it’s expensive to constantly buy items, so your best bet is to invest in leveling up your current zombies and unlocking more varieties. As you infect more and more of the globe, you’ll be rewarded. If you get the par score and kill X amount of humans, you’ll get a perfect score. That offers you a swag bag that gives you free items to use. Sometimes it will be coins, other times it will be zombies or items. Coins are used to buy zombies and items, but beating a stage well will also unlock DNA strands. You can use these to forge better behavior for your zombies, and depending on the DNA you’re using, you might unlock more zombie species. You’d think there’s not that many types of zombie, but you’d be mistaken. There’s 30+ to choose from in the game, and there’s everything from zombies that spit on foes to brutal berserkers to fat zombies and much more. You’ll even come across unique one of a kind zombies, such as a nuke toting Kim Jong Un clone. The important thing to remember is you need zombies to craft zombies. Generally, you use your most common zombie as a starting point. To keep you from running out entirely, you can earn more of that strain by doing well in stages. But you’ll rarely get rewarded with the more exotic types. This forces you to be conservative in how you craft, since if you’re not careful you’ll spread yourself thin and only be able to muster a horde of weak zombies. By crafting higher numbers, you’ll be able to level up your varieties, making them faster, more powerful and keeping them walking longer. While the basic game is fun, and it’s easy to beat stages in a few seconds, the overall meta game was a bit lost on me. I spent about 2 hours playing through many, many stages and never seemed to make any real headway. I was never clear what my goal was, other than trying to beat each stage. Complicating matters, the more effective you are at spreading your blight across the world, the more the world defends itself. You’ll see a frantic news reporter talk at the end of each stage, and she’ll warn you when authorities are fighting back. Human labs will try and develop a cure, and armed services will become more frequent in stages. At first you’ll be able to beat stages with ease, but it becomes much harder when the humans fight back with guns. 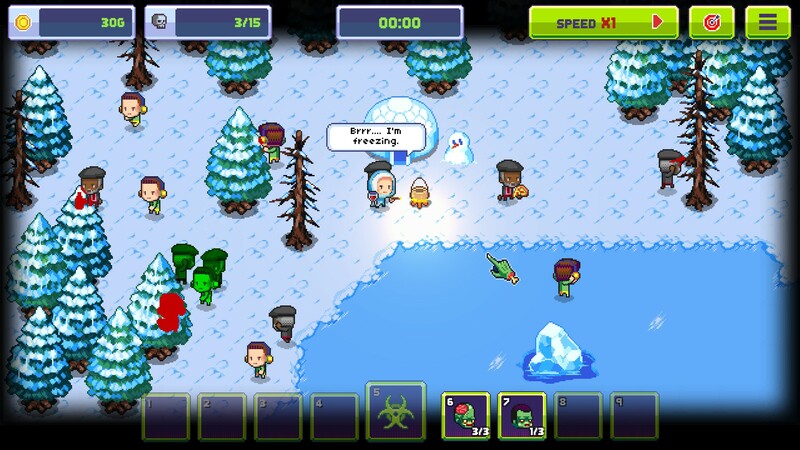 Infectonator 3: Apocalypse has a nice cartoony style, which kept me entertained as I played. The music is okay, but nothing to write home about. That said, I did mostly enjoy my time with the game. It’s pretty basic, but it’s nuanced enough to keep me interested in what’s essentially a upgraded mobile game. I just wish the interface that teaches you how to play the game was a bit more transparent about what you should be accomplishing as you play. But if you don’t mind a game that is simple and somewhat meandering, you can certainly do worse than fun with zombies.